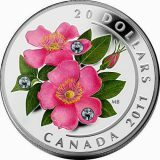 Date of issue: August 20, 2009. 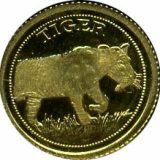 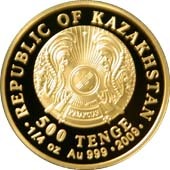 Averse: State Emblem of the Republic of Kazakhstan; face value of the coin “500 TENGE”; legend in English “REPUBLIC OF KAZAKHSTAN”; “1/4 oz Au 999” means metal, standard of coinage and weight; “2009” means the year of coinage. 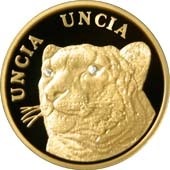 Reverse: image of ounce with ingrained diamonds into eyes; name of the coin in Latin “UNCIA UNCIA”. 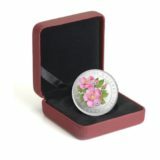 Diameter: 25 mm with two diamonds of one millimeter diameter.